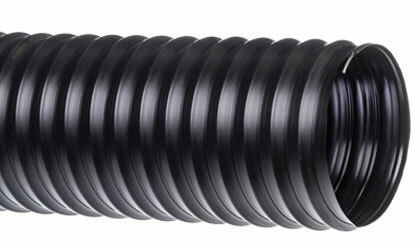 Hose is constructed with oil resistant, low temperature black Ether polyurethane (TPU) and a steel wire helix which provides a higher service temperature range of -65°F (-54°C) to 225°F (107°C). The helix wire can also be grounded for static dissipation. Urevent™ Black is designed for wet or dry abrasive applications such as concrete resurfacing dust collection, ventilation and fume removal, insulation blowing and oil mist collection. Click here for more info.